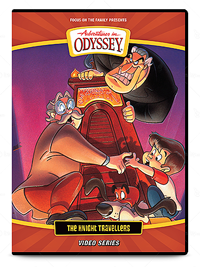 As we’ve mentioned before, it was only a matter of time before we see the Adventures in Odyssey animated series—created during the 1990’s and onward—re-emerge for new generations of fans. Unlike what we had originally thought, the entire series of animated DVDs will receive an updated cover design, including the four “New Series” titles. Please note that the “New Series” title treatment has been abandoned and the entire series of animated episodes (Original Series and “New Series”) will all become one consistent collection. With all the DVDs housed under distributor Tyndale House Publishers (formerly Tommy Nelson), fans can expect the consistency they’ve always wanted. The complete animated series features 17 titles, each sold separately. Click to see larger views of each cover, or visit our DVDs section to see all the titles and high-res images. Be on the lookout for these upcoming DVD re-releases in local Christian bookstores and online April 2013 or later! For now, you can visit our brand-new product pages for these upcoming DVD titles on our DVDs page. Higher-resolution images are also available as well.